Getting married in the Cook Islands is romantic, easy and uncomplicated. 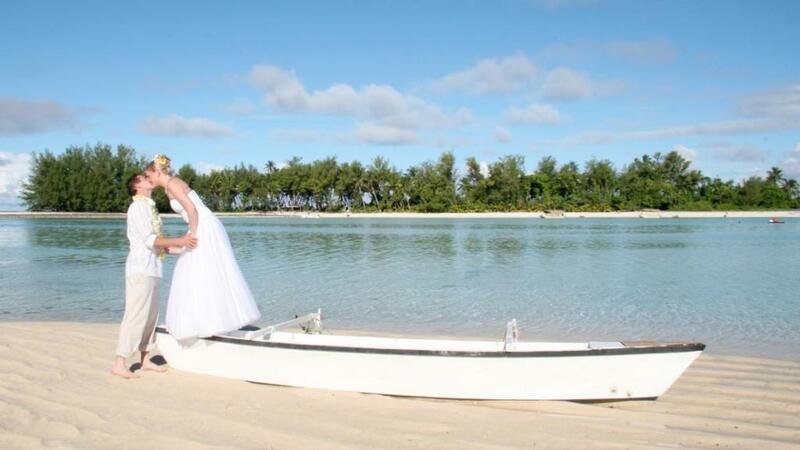 The Cook Islands is a true Pacific Islands paradise, and an ideal choice for an unforgettable tropical island wedding. The Cook Islands contain some of the most beautiful and diverse scenery of any group in the South Pacific and the people are warm and genuine, always greeting you with their beautiful smile and friendly eyes. Marriages in the Cook Islands are legally binding and internationally recognised. The legal age of consent to marry is 20 years, otherwise written approval by parents is required. Applications for a License must be made in person to the Registrar of Marriages in the Cook Islands at least 3 working days prior to the marriage. The Registrar may waiver the three day requirement in special circumstances, but your wedding coordinator must apply in advance and a small fee is applicable. Application for this license cannot be made outside the Cook Islands. Your passport and birth certificate will be required when filling out the "Notice of Intended Marriage" at the Registrars Office. Catholic couples will need to have completed a course for engaged couples, such as the FOCCUS program, and will need to have Baptism Certificates. If you have been widowed you will need to provide the Death Certificate of your spouse. Mataora - Island Charm wedding package: A delightful way to say 'I do' beside the lagoon or amongst the tropical gardens. Package features a fresh floral archway, island string band, tropical flower bouquet for the Bride, loose flowers for the Bride's hair, Neck Ei Garland for the Groom, wedding cake, Methode Champenoise, platter of canapes and tropical fruits, ceremonial planting of the 'Uto' (baby coconut palm), flame touches (for sunset ceremony), Celebrant or Minister, witnesses, Marriage License and transfers to Registrar of Marriages, personal wedding planner, island gift from The Rarotongan. Barefoot Elegance Wedding Package: Includes wedding on site, return transfers to the Registry office for process of Marriage License, Marriage License, Minister or Celebrant, small bouquet posy for the Bride and button hole for the Groom, liaison with personal Wedding Coordinator, bottle of sparkling wine and a Moana gift. Wedding Fever Package: Includes Wedding Coordinator, transfers to town, Wedding License, Celebrant/Minister, witnesses for wedding, flowered archway on lagoon edge, head garland for Bride, neck garland for Groom, professional photographer and 40 photos (including album & negatives), celebration bottle of champagne, celebration canapes for 2, wedding cake, island serenader for ceremony, wedding gift on turndown, Under the Stars - 3 course celebration dinner for 2, morning after celebration breakfast for 2 served on your own private balcony. Pacific Wedding Ceremony: Includes choice of venue, Wedding License, services of a Minister, flower leis for the bride and groom, flower arrangement for ceremony table, coordination from Pacific Resorts wedding team.